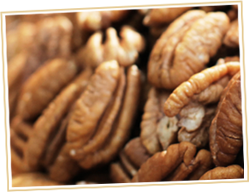 Our TUCKER PECAN COMPANY logo tin is decorative on the outside and filled with delicious, fresh pecans on the inside. This nostalgic tin comes filled with your choice of fresh Natural Mammoth Pecan Halves or Roasted & Salted Mammoth Halves. Available in 1 ¼ lb. and 2 lb. 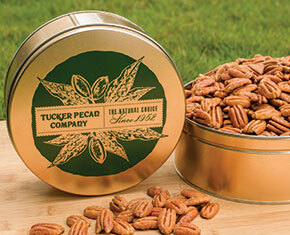 sizes, the TUCKER PECAN COMPANY logo tins make excellent gifts throughout the year.